Apologies for the hiatus, and a big thanks for understanding - it's been a very busy summer over at Savoury Sweets! 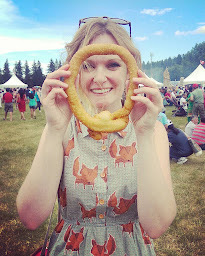 Weddings, events, and birthdays galore - as well as a wonderful two-week vacation to the (very underrated) west coast of Canada. I've finally managed to find a few minutes, so I'm here to continue sharing healthy, plant based recipes to bring some colour to your plate, and variety to your diet! 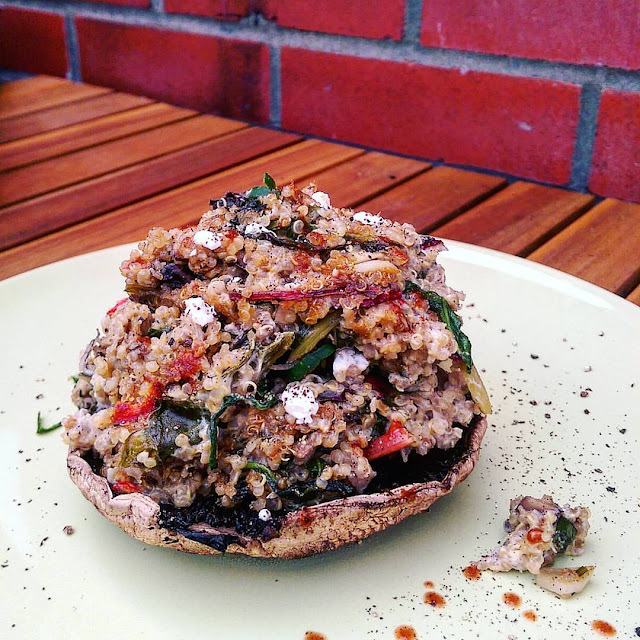 I'm going to start by sharing something that I've been dreaming about since I made it - a quinoa & veggie-stuffed portobello cap. (Side note - Portobello? Portabella? Portobella? However you spell it, it's a giant, delicious mushroom.) I posted a photo on Facebook and immediately had multiple requests for the recipe - you ask, I deliver! During my travels, I stumbled upon many secondhand bookshops, each one more adorable than the next. It was very hard not to take everything home with me. I did snag a wonderful book called Grain Power (Green & Hemming, 2013), which is what inspired this creation. Not only is this dish colourful, flavourful, and quite photogenic - but it's also filling enough to be a standalone meal. Bonus - the whole thing comes together quickly, and the filling can be prepared in advance - so it's great for a quick weeknight meal, or for a last-minute vegetarian or vegan dinner guest. Double bonus - it's gluten-free, and can be vegan if you omit the cheese, or use vegan cheese! Remove stems from mushrooms, setting the caps aside. Chop mushroom stems. Bring quinoa and water to a boil. Cover, reduce heat to low, and let simmer about 15 minutes, until all water is absorbed, and quinoa is fluffy. Set aside. Heat 3 tbsp oil in large saucepan. On medium heat, cook onions, stirring intermittently, about 15 minutes, or until they start to brown. Add garlic and stir. Add peppers and mushroom stems and cook until soft, about 10 mins. Add spinach, continue cooking until wilted. Add quinoa to saucepan and stir, combining everything. Drizzle with remaining oil, lime juice, tarragon, paprikas and turmeric. Add salt and pepper to taste. Scoop mixture into portobello caps and sprinkle with cheese, if using. BBQ, or place on a tray and low broil, until cheese is melted, about 4 to 6 minutes. Serve hot, garnished with smoked Tabasco, if desired.